Dorothy Catherine Bauer passed away on Sunday, March 17, 2019, in New Orleans, Louisiana. 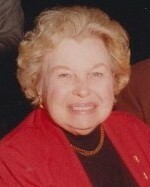 She was the beloved wife of the late Charles F. Bauer, Jr. Loving mother of Beryl B. Koehler (Paul), Christine B. Fox (Daniel) and the late Frank Bauer. Sister of Calvin Elstrott and the late Burnell Elstrott. Grandmother of Todd and Janel Koehler. Loving aunt of several nieces and nephews. Relatives and friends of the family are invited to attend the funeral service at Tharp-Sontheimer Tharp funeral home, 1600 N. Causeway Blvd. at 43rd Street on Monday, March 25, 2019, at 1:00 PM. Interment in Cypress Grove Cemetery. Visitation from 9:00 AM until 1:00 PM on Monday, March 25, 2019. Condolences may be expressed online at www.tharpsontheimerfh.com. Information 504-835-2341.